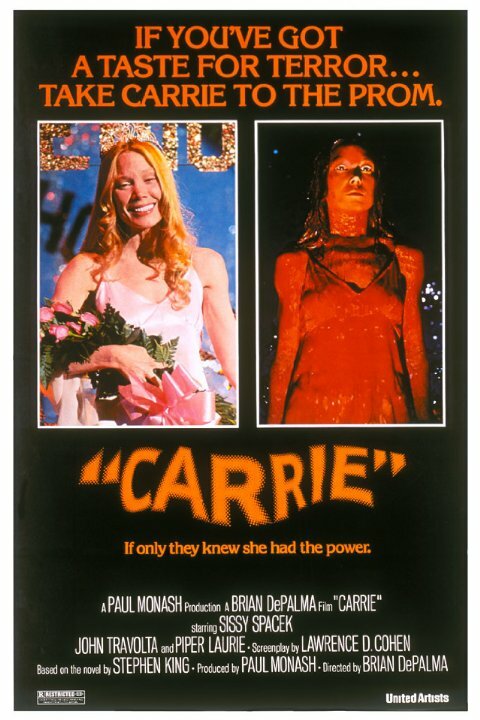 The film Carrie explores the way in which the things that scare us most can give us the most power. Carrie brings us another important scene in which the closet again figures prominently. 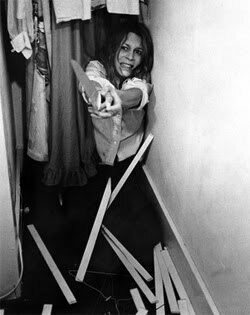 Near the end of the film, Carrie kills her mother in self-defense and then, in her grief, destroys the entire house while she dies in the closet holding her mother’s body. A horrific scene in its own right, this scene differs in many ways from the final closet scene in Halloween. The music in the scene from Halloween can hardly be heard as Laurie runs into the closet, leaving us the sounds of her breathing and whimpering, Meyers’ grunting, and the horrible crashing noises as Meyers batters down the closet doors. Conversely, as the house in Carrie begins to collapse, beautiful choir music swells, partially drowning out Carrie’s desperate cries as she tries to heave her mother into the closet. The blaring angelic music serves, in a way, as a balm for the horror of the moment, hinting that salvation is close at hand within the safe confines of the closet. Another stark difference between the two scenes is the application of several hand-held camera shots. The Halloween scene employs several hand-held camera shots as Meyers tears apart the closet in his attempt to murder Laurie. The frame shakes, making it look like the very walls of the closet are being torn asunder. On the other hand, the unsteadiness and jostling of the camera in the last few shots of the Carrie scene, gives the opposite feeling. One feels as if the outside world is falling to pieces, but the objects within the closet are staying still, calm, and protected. Additionally, the light filtering into the closet from the outside in Halloween is cold and sharp, an example of hard lighting quality, illuminating next to nothing. The light filtering into the closet from the outside in Carrie is warm, an example of soft lighting quality, and illuminates many of the dark corners we saw before, giving us a sense of closure, or things seen and now known. The place that Laurie thought would keep her safe essentially turns on her without warning. In Carrie, while the closet is shown as a horrific space that Carrie has to be dragged kicking and screaming into at first, she does, in the end, retreat to it. Clutching the body of her mother, Carrie crawls into the closet, shutting the door as the house crumbles down around her, feeling safe enough to breathe her final breath. Ultimately, the space is represented as a “safe” space; closed in and protected from outside forces and influences. Indeed, Laurie of the film Halloween clearly views closets in the same way. Having failed to kill Mike Meyers, she flees into the closet of the master bedroom, cowering in the bottom corner. Here she feels she is safe; she has a chance of surviving. However, the closet is turned into a death trap, a potential final resting place for Laurie, as Mike Meyers hacks and beats his way into the windowless, cut-off space, in the end defining it as a nightmarish hell of escalating terror. These two vastly different interpretations of the same space strike chords with audiences everywhere. As children, many of us were plagued by monsters lurking behind the closet door, waiting until nightfall to drag us screaming out of our beds and into their realm. Yet, these same children may have also hidden in closets from angry parents or unpleasant family events, closing the door from the inside as if that act alone created a completely separate, impenetrable universe. These two films have, through their many similarities and striking differences of mise-en-scene, exposed in us a paradox as much mental as physical. As human beings, we all seek privacy; our own space, our own special, lonely places in the world. Yet, there is something deep within us that warns against this isolation; a primal instinct that makes us fear the dark recesses of the mind and cautions us from locking ourselves up in our own personal closets. For where, and to whom, will we run when our monsters come looking for blood? This entry was posted in Academic and tagged Academic, Arts, Carrie, Creative, Essay, Halloween, Horror, Horror Films, Jamie Lee Curtis, Movie, Movies, Non-Fiction, Robin Jeffrey, Writing. Bookmark the permalink.